There is a sacred corner of the restaurant universe where no kale or quinoa is served. In this oasis, the servers do not recite an endless list of complex daily specials; they are not named Todd, and they are not aspiring actors waiting for their big break. Angelo’s of Mulberry Street has been in business since 1902, and the place has not changed significantly in decades---not since the early 1980s, at least, when I first started going there. It is easily the best restaurant on the street, serving a collection of both Northern and Southern classics executed with lightness and grace. It would stand out anywhere, but is even more notable among the feeding troughs of New York’s Little Italy. There are sidewalk tables fronting on Mulberry Street, excellent for watching the passing parade in good weather (particularly now, since the street has been turned into a pedestrian thoroughfare). The two long, narrow dining rooms culminate in a private area in the rear of the restaurant. The tablecloths are white and the table settings are sparse. A recent visit began with a pristine octopus salad: tender chunks marinated in extra virgin olive oil and studded with garlic cloves, diced celery and several varieties of olives. You break off pieces of Angelo’s crusty country bread, dip them in the oil, and in between sips of Falanghina you reflect on how lucky you are to be alive. Angelo’s serves the best Linguine alla Vongole in the known universe. The clams are beautifully briny and fresh, remarkably tender, served in their shell in a white wine sauce studded with garlic and placed atop a bowl of perfectly cooked pasta. A dish of angel hair with shrimp in a spicy tomato sauce is equally successful. The rest of the menu is a roll call of Italian favorites such as scungilli, spiedini alla Romana, pollo scarpariello, and dentice Livornese. Your choice may be rustic or elegant, depending on your mood. Back to those waiters: They are white jacketed and unsmiling, and they do not introduce themselves by name or regale you with jokes. They do not relate their life stories to you, in the hope of bonding for a larger tip. What they do is serve you, and their service is attentive and unobtrusive: old-fashioned and Old World, a soothing relief in modern times (146 Mulberry St., (212) 966-1277; angelosofmulberryst.com). Located at Broadway and 64th St., across from Lincoln Center, Bar Boulud was celebrity chef Daniel Boulud’s first foray outside the elegant realm of haute cuisine. He did the natural and expected thing and reverted to his roots. Boulud grew up on a farm outside of Lyon in France’s Burgundy region, an area many consider to be the gastronomic epicenter of the country, a place where the cooking is rich, rustic and satisfying. Bar Boulud’s menu reads like a roll call of classic dishes. There’s escargot from Burgundy, of course, as well as a Lyonnaise Salad (frisée topped with chicken livers, lardons and a fried egg). There are several varieties of sausages. The charcuterie program is broad and deep, with two artisans dedicated to creating the impressive range of cured meats and patés that Bar Boulud offers daily. Other familiar menu favorites include Parisian beef tartare, onion soup, moules frites, trout Grenobloise and Tarte Flambée. If you’re watching your pennies, there are prix fixe menus at lunch and dinner, $32 and $48 respectively for three courses. As at all of Boulud’s restaurants, the wine list is lengthy and carefully chosen. The selections are divided into three categories: Classics, Discoveries and Legends. There is a bonanza of wines from both Burgundy and the Rhône Valley, well-crafted gems from small producers that you’re not likely to find elsewhere. Given the location and the popularity of Boulud himself, the restaurant could fairly be described as a madhouse---or, to put it another way, this isn't the place for a philosophical conversation or romantic date. Be sure to reserve (1900 Broadway, at 64th St., (212) 595-0303; barboulud.com/nyc/). The midtown outpost of Chef Daniel Boulud is a sleek cross between casual bistro and elegant dining. You can sit at a communal table in the bar area and relax with cocktails and snacks, or enjoy a leisurely meal in the white-tablecloth dining room. The hybrid nature of the restaurant extends to the menu as well. On one end, there are bistro classics such as Pâté Grand Mère, Steak Frites and Coq au Vin. At the other end of the continuum, there’s lobster salad and Dover Sole Meuniere. Anyone familiar with Boulud knows that the objective here isn’t necessarily a desire to offer something for everyone, but really reflects the man’s sizable culinary wingspan. The most famous dish on the menu, and the best example of its dual identity, is the DB Burger: a sirloin burger filled with braised short ribs, foie gras and black truffles. The epitome of excess? Perhaps, but it kicked off the gourmet hamburger craze when it first appeared in 2001, and the restaurant still claims bragging rights over that. Speaking of offering something for everyone, you can have breakfast, lunch or dinner at DB Bistro Moderne. There’s a lunch prix fixe at $32 for two courses, and a three-course Pre Theater special for $50 per person. Brunch is served on Saturdays and Sundays, and special menus are offered for holidays. As with most of Boulud’s restaurants, the wine list is stellar. The selections are heaviest in Burgundy (the chef’s home region), Alsace, Bordeaux and the Rhone Valley, but California is also well represented. There’s an extensive range of wines by the glass, including some high-end wines offered via the Coravin system. If Boulud hadn’t pursued a career in the kitchen, he would have done well in real estate. Virtually all of his restaurants have perfect locations. This one is located one block east of Times Square, making it easily accessible for tourists, theater-goers and business people (55 West 44th St., (212) 391-2400; dbbistro.com/nyc/). It may be tempting at times to criticize Mario Batali and Joe Bastianich, the creators of a nearly global restaurant empire comprising two dozen establishments. However, any qualms that consumers might have about them tend to fade when confronted with their magnum opus, the Eataly market in Manhattan. Calling Eataly a food market is roughly equivalent to describing a dinosaur as a lizard. Located at 5th Avenue and 23rd St. in the Flatiron district, it sprawls over an entire city block and more than 50,000 square feet of space. The place is more accurately a shrine to quality Italian food products of all sorts. The concept was originated by Oscar Farinetti, the largest electronics retailer in Italy, who opened his first market in Turin in 2007. There are now 11 locations throughout the country, as well as Istanbul, Japan and Dubai. The American operation was fueled by Mario Batali’s star power and the organizational talent of the Bastianich family; the New York location is celebrating its fourth anniversary, and a Chicago market opened last December. Craving summer truffles, 100 varieties of fresh pasta, or every possible form of prosciutto, seafood, bread or imported cheese? Eataly has it all, along with seven restaurants, a cooking school, a Nutella bar, several wine bars and a retail wine shop. Vegetarians need not fret: There’s a vegetable butcher on the premises who will wash and cut your produce to your specifications. A first-time visitor could easily spend an entire morning or afternoon wandering through the place and not see everything. Eataly’s manifesto invites consumers “to be active participants in an innovative food and beverage experience,” and one glance around the market on a weekend shows how well they have succeeded. The massive space is filled with New Yorkers who are relaxing, socializing with friends, sipping a glass of wine or dining at one of the food counters. The experience is helped along by the friendly and accommodating staff---Eataly “ambassadors” who seemed informed on every aspect of the operation. The Medieval market in the town square has met the global village, and everyone seems happy (200 5th Ave., (212) 226-2650; 4 World Trade Center, 101 Libert St., Floor 3, (212) 897-2895; eataly.com). 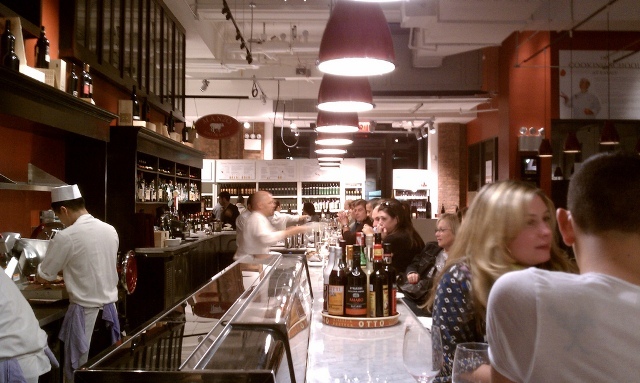 Note: The above comments refer to Eataly’s Flatiron location on Fifth Avenue. Where is the comfort food of yesteryear? A lot of it has come back, of course, but some of it never really disappeared in the first place. If you doubt this, pay a visit to Eisenberg’s Sandwich Shop. Eisenberg’s is located at 174 5th Avenue, in the Flatiron section of Manhattan. You pass through a dilapidated entrance to a very long counter: several dozen old-fashioned swivel stools, wrapped in the traditional red leather. A row of tiny tables faces the counter and extra seating is available in the back, but the front room is the place to be, decorated with photos of long-dead celebrities your grandparents might recognize. “Raising New York’s cholesterol since 1929,” runs the first of their two mottos, and the menu bears this out. Remember that this place calls itself a sandwich shop, not a deli. There are no overstuffed $22 sandwiches with cutesy names here---just a roll call of solid, honest dishes at reasonable prices. The countermen are silent and serious, frequently too busy to be as nasty as their deli counterparts. You are welcomed with a dish of pickles as you peruse the nearly endless menu. Begin with matzo ball or chicken noodle soup, or try some cold borscht. There’s pastrami, corned beef, brisket, reubens and the “perfectly imperfect” tuna melt. All-day breakfast is available. Side dishes are as diverse as potato latkes, chopped liver, knishes and corned beef hash. Wash it all down with an egg cream or lime rickey, and save some room for the famous carrot cake. Given the fact that Eisenberg’s has survived long enough to become chic once again, you might expect the place to be filled with yuppies and tourists. In fact, the counter is jammed with the denizens of the neighborhood, who have likely been coming here all their lives (although you might see Anthony Bourdain when he’s in town). This brings us to the second motto: “You either get it, or you don’t.” Truer words were rarely spoken (175 5th Ave., (212) 675-5096; eisenbergsnyc). In almost every city there are restaurants that rise above the level of eateries and become institutions. The Grand Central Oyster Bar is one of those. Originally opened in 1913, it is located on the lower level of one of the world’s most beautiful railroad terminals. By the early 1970s, rail travel in America was almost extinct, and the Oyster Bar had died along with it. It was brought back to life by a veteran restaurateur named Jerome Brody, who redefined the concept and sourced the freshest possible seafood from a network of suppliers around the country. It is thriving today, and has spawned an elaborate, upscale food court on Grand Central Station’s lower level. In its current incarnation, as before, the Oyster Bar is a huge place, with seating for nearly 450 in an assortment of different venues. There is a formal dining room, a pub, a more elegant lounge area with table service, and a real oyster bar with guys shucking shellfish to order. The heart of the place, though, is a series of five counters facing the open kitchen, each holding 14 diners and offering a quintessential American experience. You sit at one of those counters and confront the impossibility of choosing something from the encyclopedic menu. Can’t decide between New England and Manhattan clam chowder? They’ll give you half and half in the same bowl, and both are better than anything you may have tried previously. Want a piece of fish? Select from more than 20 pristine species. There are cold platters, fried platters and shellfish assortments. And of course there are oysters, well over a dozen different varieties on any given day, available by the piece. In Michelin parlance, the Grand Central Oyster Bar is worth a detour. 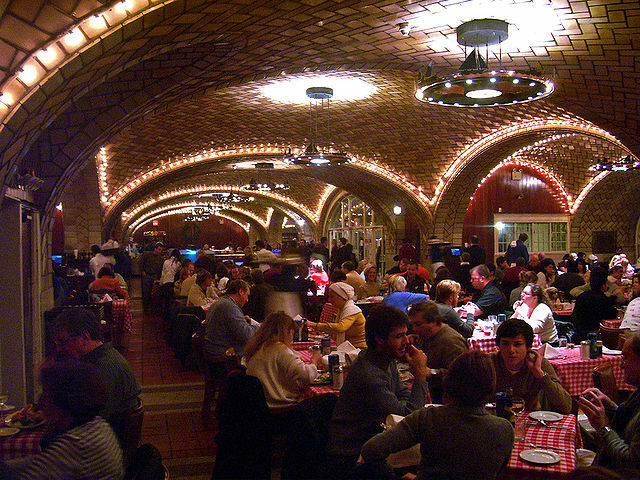 If you come to New York, don’t miss it (Lower Level, Grand Central Terminal, (212) 490-6650; oysterbarny.com). Buffets are tricky, since quality and quantity are hard to find under the same roof. There are a few exceptions in Las Vegas (the Bacchanal Brunch at Caesar’s and Bally’s Sterling Brunch come to mind). The Sunday brunch at Manhattan’s Waldorf-Astoria is certainly was a contender in its day. Locally, Sunday brunch at The Breakers is one of the finest experiences the area has to offer. As exceptional as those buffets are, they’re only offered one day each week. Turning out a top-quality buffet twice each day, seven days each week, is a challenge beyond imagining. In a city filled with delightful Japanese eateries, IchiUmi is a satisfying treat. Located at 6 East 32nd St., right off Fifth Avenue, the two-level restaurant is capable of seating hundreds of customers, although management carefully spaces out the reservations to avoid chaos. The selection is virtually endless, starting with nearly three dozen varieties of nigiri, including fresh local fish and imported delicacies such as the rare Japanese surf clam, along with a dozen or so maki. There’s a broad selection of sashimi, of course, and a station with clams and oysters shucked before your eyes. The raw bar itself is worth the price of admission ($34.95 on weekends, lower on weekdays), considering that it’s difficult to find a dozen raw oysters for less than $35 at any reputable Manhattan restaurant. The panorama of cooked dishes is just as wide and tempting---on a recent visit, I stopped counting at fifty. The hot side of the menu includes a hibachi station, where meat and seafood is grilled to order while you wait. Desserts are basic (primarily ice cream and pastries baked on the premises), and the wine selection pales when compared to the sake list---par for the course at most Japanese restaurants around town. Service is quick and attentive, but be advised that IchiUmi has recently instituted a 9% “administrative fee,” which they claim goes toward staff salaries and eliminates tipping. In conversations with servers, it became apparent that the fee may not be ending up in their paychecks, so make sure to ask and verify if this is really the case (6 East 32nd St., (212) 725-1333; ichiumi.com). Morrell opened in 1999 as Manhattan’s first wine bar, and remains its best. A large part of that success is due to its pedigree. The original Morrell brothers, Samuel and Joseph, started out as wine salesmen in the 1920’s. When Prohibition hit, they survived by peddling their wares to churches, synagogues and doctors (a lot of people suddenly got religion during the dry years). Samuel opened a wine store in 1947, and Morell and Company grew into one of the city’s largest and most sophisticated retailers, rivalling Sherry-Lehmann in selection and depth. 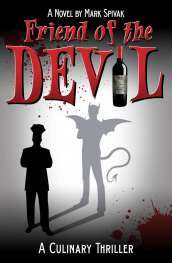 They were the first Manhattan shop to hold a public wine auction, and also the first to auction wine on the web. That depth and selection from Morrell and Company has naturally migrated next door to the wine bar. The wine list runs to 60 pages and contains well over 1,000 wines, and there are 150 rotating wines available by the glass. In addition, diners have access to the company’s formidable Rare Wine Vault. Your best strategy is to look the list over online before you go, rather than spending an hour perusing it while your guests wait thirstily. Morrell has a secret weapon that most wine bars lack: real food. Rather than a lackluster assemblage of cheeses, paté and charcuterie, there is a full menu at lunch and dinner. Cheese and charcuterie are available, of course, but so are raw bar selections, soups, salads, pasta, and entrees such as salmon, butter seared scallops, hangar steak, short ribs, cassoulet and duck breast, making the food just as satisfying as the wine. The wine bar’s location in Rockefeller Plaza makes it convenient to shopping, sightseeing and the theater district, so reservations are imperative (1 Rockefeller Plaza, (212) 262-7700; morellwinebar.com). Pigs sometimes fly, snow sometimes falls in South Florida, and I sometimes wait for a restaurant table---about as frequently as the first two occurrences. Even so, I didn’t mind being stacked up for 45 minutes at the Russ and Daughters Café on the Lower East Side, on the hottest day of the summer. Joel Russ emigrated to America from Germany in 1907. He began his new life by selling strings of Polish mushrooms that he carried on his back; eventually he became successful enough to purchase a pushcart, then a horse and wagon, and opened his first store on Orchard Street in 1914. He moved around the corner to East Houston in 1920, and his store became a legendary supplier of what Jewish people refer to as “appetizing”: salt cured salmon, schmaltz herring, sturgeon, whitefish, sable, and chubs, accompanied by bagels or bialys. 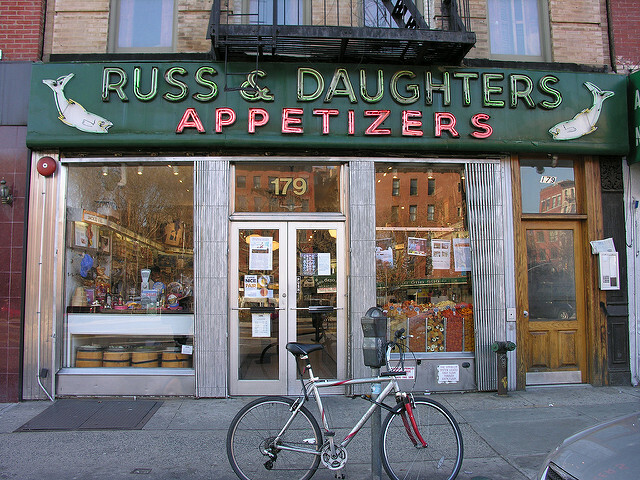 His daughters Hattie, Anne and Ida come to work for him, and in 1935 his establishment was renamed Russ and Daughters. The Café debuted last May and has been packed ever since. The building is long and narrow, like many spaces on the Lower East Side, and is faithfully decorated to resemble the store. White, bright and modern, the décor initially seems to conflict with the operation’s traditional aura---until you hear a female voice wailing plaintive Yiddish ballads over the sound system. The meaning of the lyrics is probably lost on the Millennials and Gen X-exers who crowd into the place, but the music is a reassuring reminder of the past. When finally seated, lunch began with a stunning whitefish chowder: chunks of smoky fish resting in a pool of creamy broth, studded with celery, carrots and potatoes. Most people would choose lox in these surroundings, but we opted for sturgeon---the fish that seems to have migrated away from South Florida. Mine arrived sliced, served on a wooden board with butter, tomatoes, capers and red onion, accompanied by a warm, moist bialy. My wife’s Sturgeon, Eggs and Onions was served with dense pumpernickel bread that seemed to have materialized from another universe. It’s actually the creation of Gordon Weissman, the baker imported from Massachusetts by the fourth-generation Russ women after tasting his incomparable shissel rye. If you’re craving smoked fish and planning a trip to Manhattan, don’t let those lines deter you: a second Café location, designed to catch the overflow, is planned for next year (127 Orchard St., (212) 475-4880; russanddaughterscafe.com). Where do you like to eat when you're in Manhattan? Share your insights with the community!